The fully automatic PAL-Cut sheet dispenser cuts fast and accurate Antim65 ® non-slip paper in pre-programmed length directly from the roll. This is how the Antim65 ® anti-slip paper is offered to the millimeter. 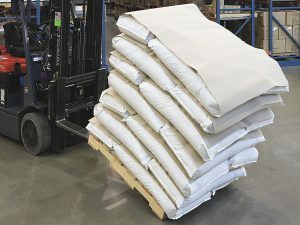 The non-slip liners are used to stabilize the goods on pallets. In addition, transport damage is over – thanks to Antim65 ® non-slip liners, anti-slip paper or simply anti-slip paper. PAL-Cut 800/1200 is a fully automatic sheeter that cuts off anti-slip paper quickly and precisely to the desired length. The sheeter is suitable for use in industrial plants with a large consumption of intermediate layers for continuous operation in an automatic palletizing system. Anti-slip paper, anti-slip paper or non-slip liners are cut off directly from the roll. An improvement in the flexibility in automatic palletizing led the German company Südzucker AG to look for new ways. The new PAL-Cut sheet dispenser has led to considerable efficiency gains and a smooth transition from full-to-half pallets. A welcome side effect of the new system is the improved transport safety, because the so-called slip angle of the pallets is now over 27 degrees inclination angle, which is for the strict German requirements for load securing on the roads and highways of great importance. Interleaf sheets that were misplaced or dropped into the photocell can now be avoided. At the Plattling plant 300 pallets of sugar are packed every day so it is very important that palletizing is most efficient and without stops. The problems occurred when the packing robot lifted sheets of paper from the stack of liners. Often, the suction cups picked up two or more sheets, which then fell to the floor, resulting in an inaccurate placement of the sheet (s) on the pallet. The robot then postponed the next layer of sugar packets, causing disruptions. In the meantime, Südzucker AG’s plants are equipped with automatic PAL-Cut 800 or PAL-Cut 1200 arch dispensers, which cut and prepare the Antim65 ® interlayer sheet so that the robot can only lift one sheet at a time. At the three packing lines at the Plattling plant, powdered sugar is palletized in 250 g packages, as well as sugar in 1 kg packages and powdered sugar in 10 kg sacks. The PAL-Cut machines are fully integrated in the packing lines and the transition between EU pallets in half and full size without stopping. 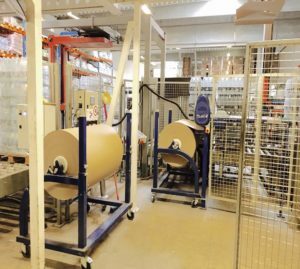 “Since we started working with the PAL-Cut solution with automatic sheet dispenser for Antim65 ® liner paper, interleaf inserting has improved significantly. This increases the productivity and thus the efficiency of the systems. With the installation of the PAL-Cut solution, the subject of the interleaf inserter is no longer mentioned, “reports Thomas Mizerski, who is responsible for packing and shipping at Südzucker in Plattling. The used liner Antim65 150 g / m² is equipped with an anti-slip coating. The material is 100% recyclable. The liner paper is available in rolls of up to 3,500 m. That’s enough for several days and compared to earlier this means far fewer stops to replace the paper magazine. “The internal warehousing and pallet spaces for liners have also been considerably reduced. Many parking spaces have been eliminated,” says Mr. Obermaier.